Naturally, conservative politicians are confident the statue will not end up on capitol grounds. Rep. Paul Wesselhoft told CNN that the statue wouldn’t be disqualified because of Satan, but because the statue has “no historical significance for the state of Oklahoma.” It is worth noting that neither do the Ten Commandments, which are believed by Christians to have been written somewhere in the Middle East. Rep. Bob Cleveland was more overt, admitting that the difference between the statues is one endorses his favored religion while the other does not. 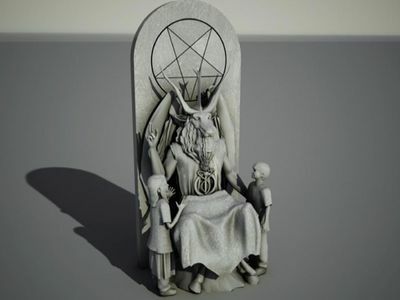 “In my opinion this Satanist monument does not meet with the values of Oklahomans,” he said, basically admitting that the Ten Commandments statue is an endorsement of the “values,” i.e. faith of Christianity. The bill specifies that “[t]he Ten Commandments, Magna Carta, Mayflower Compact, Declaration of Independence, United States Constitution, Bill of Rights, Constitution of the Great State of Oklahoma, and other such historically significant documents are recognized throughout the world,” and are therefore worthy of display. While not in total agreement, the other panelists seemed supportive of his remarks for the most part.Comment: I presume the same thing would happen if Natives tried to raise a statue to one of their deities. Many Christians consider such deities "Satanic." For more on conservative Christian hypocrisy, see Robertson Says What Conservatives Believe and Teabaggers Seek White Christian Rule.